Should natural burial grave markers be subject to standards? Humans probably have marked the graves of their dead for as long as they've lived in social groups, but the rise of massive cemetery headstones occurred only in the last couple centuries in America. It's easy to evoke an image of a modern cemetery with just a few strokes; green grass and upright stones or elaborate statues carved from stone and engraved and you know what it is. There's nothing wrong with wanting to memorialize a loved one or to be memorialized yourself. Thomas Jefferson left explicit instructions for creating his tombstone, including engraving three accomplishments "because by these," he explained, "as testimonials that I have lived, I wish most to be remembered." We don't use polished granite or marble headstones in memory of people in green or natural burial grounds. It's not that rock isn't green, though one could argue that engraving uses energy. It's that we're creating a new landscape--meadow or forest usually--not something that looks like a cemetery, though that word means simply a piece of ground where burials are made, and we imbue it with our own concept of what it should look like. We are recycling ourselves back into nature and becoming a part of it. According to the Green Burial Council which sets standards and certifies cemeteries, "Natural and conservation cemeteries must develop a plan for limiting the types, sizes, and visibility of memorial markers/features to preserve or restore naturalistic vistas in the cemetery landscape." Yet I was disturbed on recent tours of green burial cemeteries along the East Coast by the proliferation of large stones with elaborate engravings. All the cemeteries I visited and those in The Natural Burial Cemetery Guide put constraints on the kind of marker that's allowed on graves. Individual grave markers are usually limited to local stone that fits the landscape, must lay flat, not be polished or machine cut to shape. A few cemeteries impose size limits; Narrow Ridge Natural Burial Preserve in Washburn, Tennessee calls for grave markers of modest size, and at Eloise Woods Community Natural Burial Park in Austin, Texas markers must be less than 2 feet across. 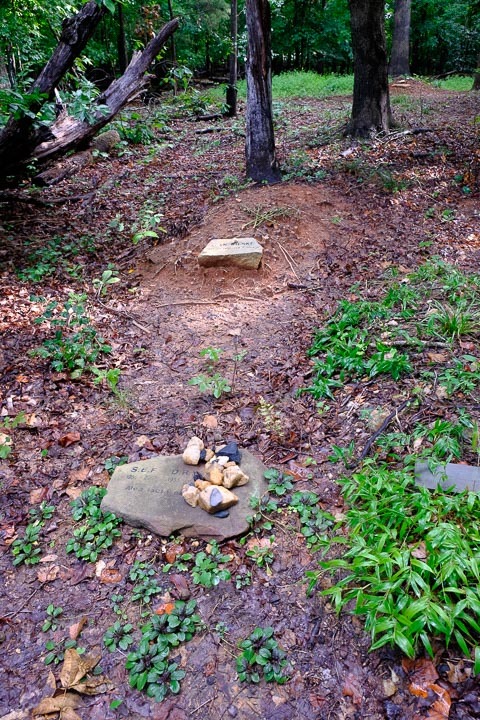 At Kokosing Nature Preserve in Gambier, Ohio graves are distinguished by unobtrusive markers. What struck me was how visible even a grave marker that fits the parameters can be. Is this a problem? Isn't stone natural, especially if it was dug up in the cemetery anyway? A hundred years from now when a natural burial cemetery has become a forest will it detract if someone walking through the forest sees gravestones? Won't it in fact be kind of neat? People sometimes perceive antipathy among green burial cemeteries to memorials. I think it's important to let people mark graves. Yet after visiting cemetery after cemetery, the size and number of objects began to worry me. Often I got caught up in bending over stones to see what they said and realized at the end that I hardly noticed the landscape that was being so lovingly created. Is the instinct to mark our passing through this world becoming mixed up with a human instinct towards grandiosity? Not everywhere, and not everyone, but natural burial actually doesn't look natural. In 20 years or so when there's nothing left of a body underground, what's the point of a personalized stone if the meadow or forest is the true memorial? Kateri Meadow Natural Burial Preserve--no stone, just different flowers mark a grave. One solution cemeteries have come up with is to prohibit markers on individual graves and go for group memorials. This is especially relevant where a burial ground is attempting to create a new landscape and prohibiting human traffic is part of the strategy for getting plants going or preserving the look of the place; this is often seen with meadows. Oak Hill Cemetery in Crawfordsville, Indiana doesn't permit individual grave markers and has erected a memorial wall with spaces for families to record the names of their dead and locate their graves in the section. Cemeteries may designate such areas as "non-visitation," and anyone burying there is aware of the limitations. The Preserve at All Saints in Waterford, Michigan has both visitation and non-visitation sections, and non-visitation burials may be inscribed on a stone memorial wall. Maryrest Cemetery in Mahwah, New Jersey, doesn't allow individual's graves in the Saint Francis of Assisi natural section to be marked but their names are inscribed on scattered boulders. There's something to be said for uniformity, like Catholic cemeteries which limit the size of headstones in their conventional cemeteries as a way to indicate that all are equal in death. Truly small stones big enough to list the name and dates of the dead would allow for memorialization but not make the oh-so-human statement of "Here I am!" St. Michael's Meadow. At Calvary Cemetery natural graves are part of the meadow landscape, with conventional sections in the distance.